I read this article and found it very interesting, thought it might be something for you. The article is called BRICS Upon BRICS: Now A $100 Billion Bank and is located at https://archive.indiaspend.com/sectors/economy-policy/brics-upon-brics-now-a-100-billion-bank-22195. Brazil has been a destination and centre of attraction in recent days, not just for organising the FIFA World Cup 2014 but also for hosting the second cycle of the BRICS (Brazil, Russia, India, China, South Africa) Summit. The key focus of the 6th BRICS Summit in Brazil at Fortaleza was the setting up of BRICS Development Bank along the lines of Bretton-Woods institutions, World Bank and International Monetary Fund (IMF). The major reason for setting up the $100 billion bank is to counter the western-dominated decision-making process in the other global financial institutions based on the quota system in IMF and voting power in World Bank. So was this new bank really needed and how does it stack up against the IMF and World Bank ? The BRICS nations have come together with a feeling that developing economies can better understand each other’s problems and issues and find common solutions. Poverty, crime, economic instability, unemployment, rising population, diseases, lack of infrastructure facilities, inflation etc.are some of the key issues across nations. These countries also have abundance of untapped natural resources and cheap labour,which stands to its advantage as a support for infrastructure development. The summit was Prime Minister Narendra Modi’s first multilateral engagement looking to improve relations and build much stronger economic and trade ties with BRICS countries. 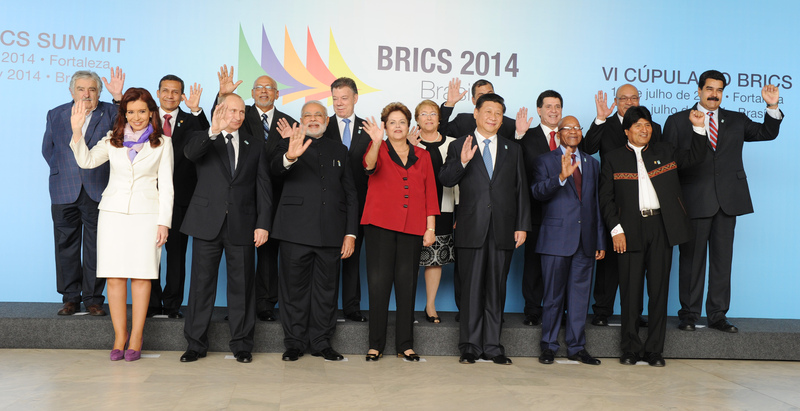 Intra-BRICS trade increased from $27 billion to $276 billion between 2002 and 2012. Let us now look at the history of IMF and World Bank. They were set up as part of theBretton-Woods settlement after the Second World War in 1944 to support and fund the development and reconstruction of shattered European countries. IMF functions as a regulatory authority providing long-term loans, stabilising the devaluation of currencies and a helping hand to tide over balance of payment crisis. It has adopted the Special Drawing Rights as an international reserve asset to regulate and stabilise the exchange rate system. Its value is based on the basket of four key international currencies and these can be exchanges for freely usable currencies. The role of World Bank is to give long-term developmental loans to fund infrastructure projects in member-countries. It consists of mainly The International Bank for Reconstruction and Development (IBRD) and International Development Association (IDA). While the former provides loans to middle and low income economies on interest basis, the latter gives grants or credits to poor countries. While IMF is headed and dominated by European nations, World Bank is headed by Americans. Hence, emerging economies have been feeling the need to have an institution to meet their needs of providing financial support for sustainable development projects. The decision-making in IMF is based on the quota system. Member countries contribute a certain amount to the IMF fund based on its economic status. Based on the financial commitment, IMF assigns a quota, which determines the voting power of the member-nations. The above data clearly shows that the developed countries contribute more and have greater voting share. The G-5 countries account for almost 39% of the total votes in IMF when compared with BRICS nations that have just 11% voting share. Developed countries control total voting share of 35.86% in World Bank compared to just 13.1% of developing economies. US dominance is clear with over 15% votes followed by Japan with 8%.The interesting thing here is the total share of BRICS countries is not even near equal to that of the U.S. The purpose of the BRICS Development Bank is to generate resources for infrastructure projects and sustainable development. The bank is to be setup a with an authorized capital of $100 billion and a subscribed capital of $50 billion, which will be equally shared by five founding members in a fixed manner over a seven-year period on installment basis. The voting power of each member shall be equal to its subscribed shares in the capital stock of the Bank. The first chair of the board of directors will be from Brazil and board of governors from Russia. The first president of the bank will be from India and its headquarters will be in Shanghai, China along with a regional center in Johannesburg,South Africa. The bank is scheduled to make its first loan in 2016. Another highlight is setting up a Contingent Reserve Arrangement (CRA) with an initial corpus of $100 billion. The agreement will work as a framework for providing financial aid through liquidity and precautionary instrument as short-term loans during balance of payment crisis.China will be contributing $41 billion for CRA followed by Brazil, Russia and India with$18 billion each and South Africa with $5 billion. The Standing Committee would be the sole authority pertaining to CRA decisions. According to BRICS members, this would be a counter measure to the unfair quota system in the IMF and voting system under World Bank to which India and China have been demanding reforms.